The Choir of Villers-Bretonneux College Jacques Brel perform at the official opening of the Sir John Monash Centre at the Australian National Memorial at Villers-Bretonneux War Cemetery, France. Australian Prime Minister Malcolm Turnbull takes a tour of the Sir John Monash Centre. 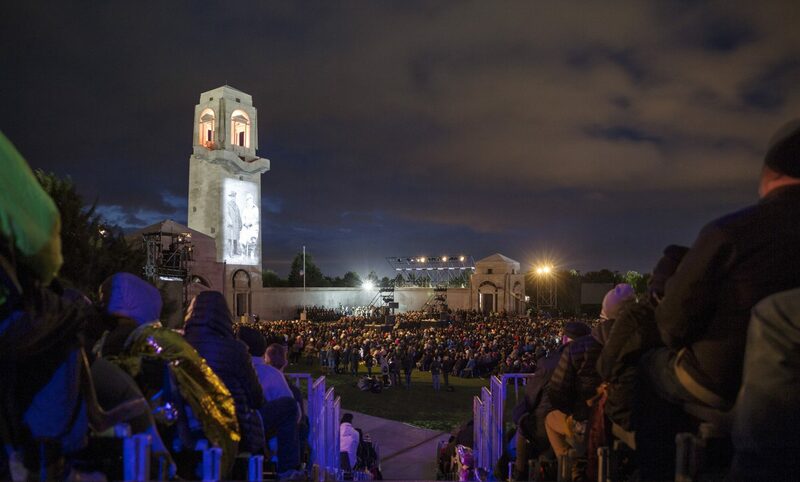 People from all over the world fill the Australian National Memorial at Villers-Bretonneux War Cemetery in France during the Dawn Service on Anzac Day 2018. Australian Prime Minister Malcolm Turnbull and French Prime Minister Édouard Philippe return to their seats after laying wreaths at the foot of the Australian National Memorial during the 2018 Anzac Day Dawn Service at the Villers-Bretonneux War Cemetery in France. Australian Army Band performs in the dark hours leading up to the Anzac Day Dawn Service at the Australian National Memorial at Villers-Bretonneux War Cemetery, France. A veteran of the Australian Defence Force watches waits for the 2018 Anzac Day Dawn Service to begin at the Australian National Memorial at the Villers-Bretonneux War Cemetery in France. His Royal Highness The Prince of Wales delivers a reading at The Australian National Memorial at Villers-Bretonneux War Cemetery in France on Anzac Day 2018.